This article points to a simple, fast way to record audio in Windows Phone 8.1. As the old Microphone class is no longer available, Windows Phone 8.1 came with new MediaCapture class to consolidate the media recording part for audio and video together. So, why waiting, let’s see how to do it! It’s pretty basic, I didn’t do much here without keeping the buttons in place. There’s a MediaElement named playbackElement1 to play back the recorded video. To capture audio, first we need to initialize the recording. Before digging into that, let’s just initialize some variables that we might need on the journey. The MediaCapture class here is the one responsible here to capture audio and video both here. And StorageFile instance will help us store, locate and play the recorded media on our device. So, the very first thing done here is the initialization of the MediaCapture class. Every media capture is associated with a MediaCaptureInitializationSettings instance. We’ve set the StreamingCaptureMode to Audio to make sure this is only audio recording rather than video. There were two bool variables declared before named _rawAudioSupported and _userRequestedRaw. Although I didn’t hook them up from GUI, you guys can defintiely try hooking them up from GUI and thus you can give the app a choice to record raw or pointing it to default audio processing. The next thing to do is initializing the _mediaCaptureManager with the settings provided. I have included two event handlers for RecordingLimitExceeded and Failed. You guys can write your own handlers of course in these cases. Now, usually you can put the InitializeAudioRecording method where your app initializes. I put it here on MainPage constructor. Now, let’s capture audio, MediaCapture class made it really easy indeed. If you have a good look on the code you will see we declared a filename first. And then we created a file in our VideosLibrary using KnownFolders.VideosLibrary.CreateFileAsync that actually points to the media and video library of windows phone 8.1 with a given filename and we also gave a CreationCollisionOption.GenerateUniqueName that says it will create a unique name in case of collision. The next thing to do is creating a recording profile using MediaEncodingProfile class and you can get all possible recording profiles for videos and audios from here. I created a M4a audio profile using MediaEncodingProfile.CreateM4a(recordProfile, this._recordStorageFile) method. Playing a recording kind of consists of two tasks. First we have to open the recorded file and then play it. If you guys remember we used StorageFile _recordStorageFile to define our file that will hold the recording. Voila! You’re done, now you can play your recording. All you have to do now is assign these three methods to proper button events. For the full source please download the demo project above. 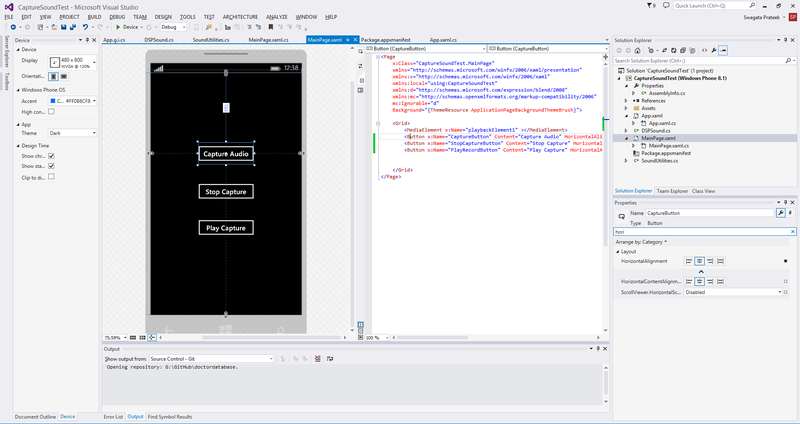 Previous postWindows Phone 8.1 for newbies: Episode 2 – Hello Xaml!